Swiftkey Flow, a new gesture-inspired typing experience, will go into beta testing very soon. 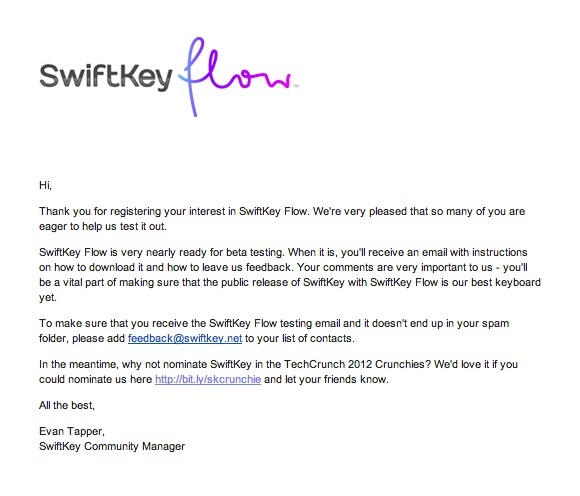 The Swiftkey team sent out reminder emails moments ago, telling you to get ready for the invite to test their “best keyboard yet.” As long as you are a part of their VIP forums and have “feedback@swiftkey.net” in your contacts to prevent it from going into spam, you should have received this email, but should also be in line to receive an invite to the beta as soon as it’s released. First teased back in October as the newest upgrade to the one of the better Android keyboards on the planet, we couldn’t help but get excited over the thought of Swiftkey getting even better. The technology is already built into the Galaxy Note 2 (well, sort of), something we’ll show you in a moment. Until then, check out the promo video below to get a feel for the new keyboard.